The patient, a 41-year-old female, presented with intermittent pain on the medial side of the right ankle. The pain was increased with ankle rotation, and patient described increased pain when stepping down “wrong”. Patient had been treated elsewhere one year prior with an ankle arthroscopy, consisting of debridement of a posterior-medial osteochondral defect and drilling of the lesion. Patient also had an open procedure to debride a posterior metaphyseal cyst in the tibia, proximal to the aforementioned osteochondral lesion. Cyst was curetted and packed with a bone graft from the patient’s iliac crest. Post-operatively, the patient was casted and non-weight bearing for six weeks. The cyst looked well-healed on x-ray and patient started a physical therapy regiment. Physical therapy included strengthening and range of motion (ROM) exercises. Weight bearing progression ensued and progressed to full weight bearing over four weeks. At four months post-operative, the patient still needed a single crutch for extended walking. The patient’s pain was minimal and strength was normal. Over the next three months the condition continued to improve. At nine months post-operatively, the patient suffered a new rotational injury, resulting in a marked increase in pain. This injury required immobilization in a boot for four weeks. Patient condition improved slightly, but continued to have ongoing pain. Patient then underwent an MRI, which revealed increased signal within the metaphyseal cyst, marrow edema and incomplete healing of the cyst. The overlying cartilage and previous osteochondral debridement was difficult to assess. A CT scan was ordered and confirmed that the cyst did not look completely healed. Patient’s initial physical exam revealed a WDWN (well-developed and well-nourished) female in overall good physical condition. Patient’s gait included a slight antalgic limp, but ankle had full ROM. The previous skin incision and scope portals were well-healed. Patient had mild swelling and palpable tenderness in and around the medial malleolus, as well as medial gutter tenderness. The posterior tibial tendon was not tender. No audible clicking, popping or crepitation was present. Patient had good strength and stability was normal. No tinel sign was noted. The neurologic and vascular exams were intact. Physician agreed with the assessment of the CT and MRI, and new plain films looked normal. Patient and physician had a lengthy discussion about the potential sources of patient’s pain. It was felt that if articular surfaces could be documented as intact, pain could then be attributed to the metaphyseal cyst and its surrounding inflammation. Patient was provided with extensive information on the Trice Medical mi-eye 2™ device and its ability to evaluate intra-articular anatomy in an office setting, at which point the patient consented to the procedure. Patient’s right ankle was prepared medially using a standard sterile protocol. Fluoroscopy was utilized to orient the patient’s ankle for a trajectory to evaluate the previous debridement and drilling. Using Ethyl Chloride on the skin, physician injected the portal track and joint with an analgesic mixture of 1% plain Lidocaine and 0.5% plain Marcaine (total 10cc) in the anteromedial ankle just medial to the tibialis anterior tendon. Under fluoroscopy, physician could visualize the track of the needle entering the joint without obstruction. Once the portal was fully numbed, the mi-eye 2™ was introduced into the ankle joint following the same needle trajectory. In-office arthroscopy revealed mild synovitis and chondromalacia of the talus. The posterior-medial aspect of the ankle was accessed via gentle traction on the patient’s heel with the non-operating hand. The prior lesion drilling had a stable fibrocartilaginous platform. No additional focal defects were noted in the ankle. The patient was relaxed and pain free during the procedure and was able to visualize the monitor, allowing the physician to share his findings as he examined. Upon completion of the in-office diagnostic, the physician discussed the patient’s treatment options. 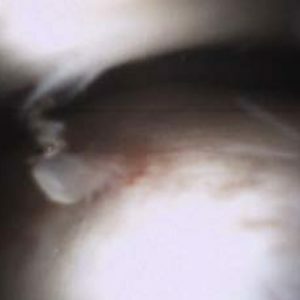 The second look via the mi-eye 2™, allowed the physician to attribute the pain to the cyst and inflammation. The patient opted to forego cyst debridement revision and graft procedure. The treatment plan decided was to put patient back in the boot and apply a bone stimulator. At very short term follow-up, the patient is showing clinical improvement.